INDIANAPOLIS -- The incoming freshman class at Indiana University-Purdue University Indianapolis is expected to be the largest and most academically talented in campus history, breaking records set only a year ago. With the fall semester set to begin Aug. 25, the latest figures show 3,927 beginning freshmen are enrolled at IUPUI. That is a 6.5 percent increase over the previous record for freshman enrollment, set in 2013. “Our dynamic environment, distinctive programs, and commitment to student success are increasingly attracting talented new students to IUPUI,” said Nasser Paydar, executive vice chancellor. Measuring academic talent by SAT scores, incoming freshmen outscored the record set by last year’s freshman class. The number of freshmen with SAT scores of 1300 or above increased 18 percent, compared to 2013. The number of freshmen in the 1100-1290 range rose 10.3 percent. Not only are there more freshmen, but they are signing up for more classes. Freshmen are taking 67,960 credit hours, up 2.7 percent over 2013. The average credit-hour load for freshmen is 13.8 for 2014, compared to 13.3 in 2013 and 10.7 in 1999. Sophomores, juniors and seniors also are taking 4.2 percent more credit hours than in 2013, reflecting efforts by the campus to have students complete their degrees within four years. 2014 will be the 19th consecutive fall semester with a record credit-hour enrollment at IUPUI. The next longest record credit-hour streak among IU campuses is seven consecutive fall semesters. In the past 15 years, IUPUI’s total credit hours have jumped by approximately one-third (over 93,000 credits) as the campus has become home to a more traditional-age student body. Traditional-age students generally take more courses than older students who often have other commitments. IUPUI continues to set records for full-time enrollment, with 71.6 percent of students full-time this year compared with 70 percent in 2013 and 52.7 percent in 1999. 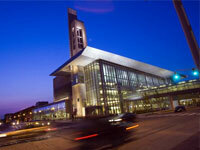 IUPUI’s total minority population is up by 5.9 percent this year. Minority students now account for 22.3 percent of all enrolled students, up from 21.6 percent in 2013, and make this the most diverse enrollment in IUPUI history. Counting enrollment for all grade levels, IUPUI will boost its enrollment of Indiana residents and nonresidents. The number of students who live in Indiana will total 26,580, a 1.1 percent increase over 2013. The number of nonresidents will total 2,923, a 13.5 percent increase. Far more Indiana residents attend IUPUI than any other university in Indiana, making it the place where Hoosiers go for higher education. There are several reasons why more students are coming to IUPUI, including a reputation as a premier university campus; but none is more important than the enthusiasm voiced by new and current students about attending, said Chris Foley, director of undergraduate admissions. “Students are excellent recruiters for the next class,” said Rebecca Porter, executive director of enrollment management and associate vice chancellor for student services.